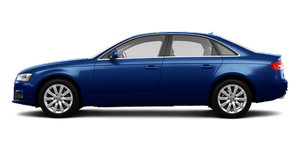 For a starting price under $33,500, the A4 comes well-equipped, with standard features like genuine leather upholstery — not leatherette (vinyl) like many competitors throw in their base models — plus dual power seats, a moonroof and single-zone automatic climate control. It's on the audio front that the other shoe drops: The standard stereo includes just a CD player and auxiliary jack. USB/iPod connectivity plus Bluetooth phone and audio streaming — features many non-luxury cars include standard — remain optional. Other options include dual-zone automatic climate control, a navigation system, heated seats and a marvelous Bang & Olufsen stereo. Like most German sport sedans, the sky's the limit with pricing; check all the factory options and the A4 can climb past $50,000. Reliability for the A4 has been good, but that isn't much of a differentiator. The 3 Series, C-Class, G37 and Lexus IS sedans are all fairly reliable, too. The A4 received Good scores in the Insurance Institute for Highway Safety's side-, rear-, roof-crush and traditional front crash tests, but it performed poorly — as did most of its peers — in IIHS' new small-overlap frontal tests, which aim to replicate a frontal collision where the impact includes just 25 percent of the car (see the results here). The C-Class, IS, 3 Series and Acura TSX received Marginal or Poor scores, too; only the Infiniti G, Volvo S60 and Acura TL received Acceptable or Good scores. Standard features include six airbags plus the required antilock brakes and electronic stability system. Click here for a full list, or here to see our evaluation of child-seat provisions.